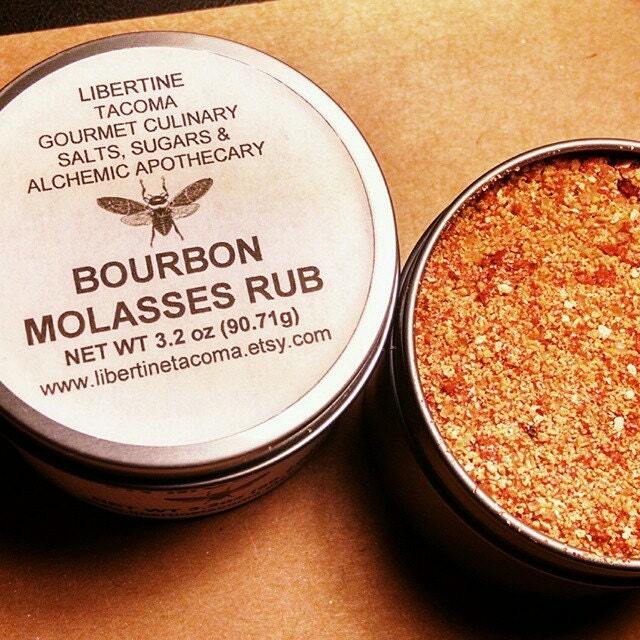 My Bourbon Molasses Rub is a great compliment to ribs, steak, pork chops, chicken and roast. So easy to use and so delicious! delicious when simply rubbed or sprinkled on to vegetables, meats, rice & quinoa. Rub seasoning into meats & refrigerate overnight for a more bold flavor. 1 Tbsp per Pound. Sprinkle on vegetables, rice & quinoa just before cooking, Blend into melted butter or olive oil for a seafood topping. Choose from a variety of packaging from the drop down menu. Tins sizes are by volume and weights vary. Bag sizes are by weight. INGREDIENTS: Demerara Raw Cane Sugar, Pacific Sea Salt, Granulated Molasses, Orange Peel, Garlic, Onion, Chipotle, Sweet Spanish Paprika, Red Bell Pepper, Bourbon Reduction. This seasoning is completely vegan and gluten free. Liberte Du Monde Gourmet Culinary Salts & Seasonings are all natural, most are vegan and additive free. No anti-caking agents are used as they can potentially be hazardous. If the salts or seasonings become “clumpy” just keep the lid tight and shake them around before using. Please store in a cool, dry place out of direct light and heat.